The Classic Controller Pro for Wii has been available in Japan for some time already, but it's making its way to these here parts this April. The controller looks like it came from the PS2 factory, and it won't plug directly directly into your Wii. Instead, you have to plug it into your Wii Remote, which isn't that much of a hassle. It'll ship with Monster Hunter Tri, but will also be sold separately for $20. 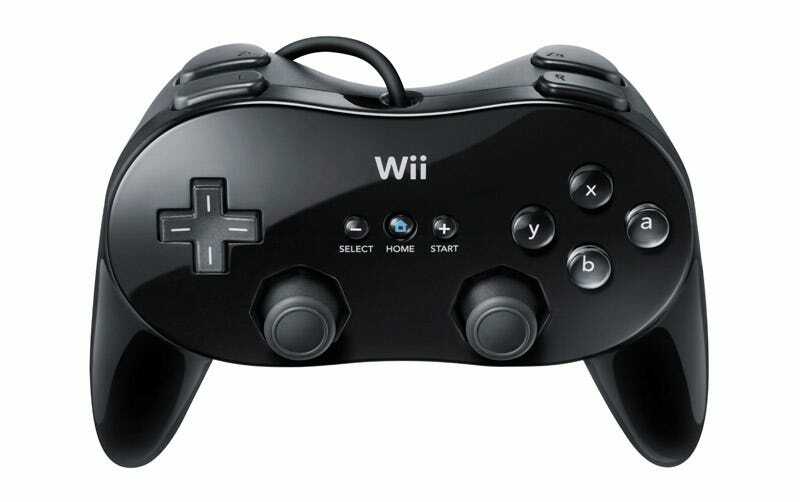 The Classic Controller Pro will come in black or white, and be compatible more than 450 Wii, WiiWare, and Virtual Console games. The design includes a second row of shoulder buttons, and an "ergonomic" grip, which sounds like marketing pablum to me. Still, though, looks neat! SAN MATEO, Calif. & REDMOND, Wash.—(BUSINESS WIRE)— Capcom® Entertainment, a leading worldwide developer and publisher of video games, and Nintendo of America today announced an exciting new bundle featuring one of the most highly anticipated titles for 2010, Monster Hunter® Tri, and combining it with the new Classic Controller Pro™ for the Wii™ system. The Classic Controller Pro's more traditional control configuration will give gamers the ultimate Monster Hunting experience when the bundle becomes available in North America this April at a suggested retail price of $59.99. "Monster Hunter Tri has made a huge splash in the Japanese market, and we're confident the bundle with the Classic Controller Pro will give fans in North America plenty to get excited about," said Steve Singer, Nintendo of America's vice president of Licensing. "Gamers of all kinds enjoy playing games on Wii. Monster Hunter Tri delivers an incredible new experience on Wii, while the Classic Controller Pro gives players even more control options for their favorite Wii games." Making its North American debut on Wii this spring, Monster Hunter Tri is one of the most strikingly beautiful titles developed for Nintendo's Wii system. Pushing the hardware to the limit, Monster Hunter Tri depicts a living, breathing ecosystem where humans co-exist with majestic monsters that roam both dry land and brand new sub-aqua environments – a first for the series. Offering the player varied control configurations to suit their style of play, players can choose between the Classic Controller Pro, Wii Remote™ and Nunchuck™, or Classic Controller™ to slay the monsters that inhabit the world. The Monster Hunter series has sold over 11 million units worldwide and has become a social phenomenon in Japan giving rise to training camps, dedicated festivals and numerous licensed products. According to Media Create, Monster Hunter Tri sold 520,000 units in its first week of release in Japan and became the leading title sold across all platforms for the week of its release.